Common reason for Deployment Tool package creation error "Packaged Execution Environment is at an earlier version than packaging system"
When building a package using the Deployment Tool, one of the most common fatal build errors in the dpcreate.log is "Packaged Execution Environment is at an earlier version than packaging system". 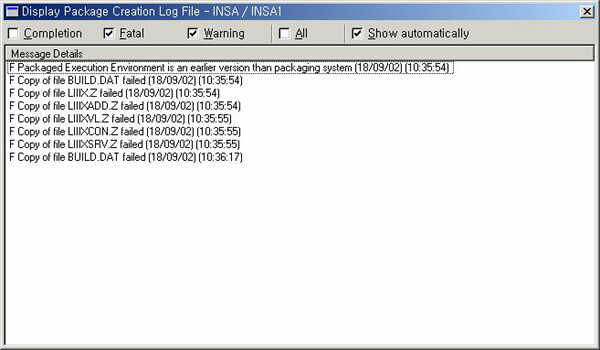 This message is generated when the deployment images have not been installed to the LANSA system creating the deployment. To successfully create a package, you will need to re-install Visual LANSA and during the install, ensure that you select the option to install Runtime Deployment Images. Run the Standard Install, making sure to Select the Deployment Images. When the install has completed, you do NOT need to Quickstart your database. Note: Choosing the custom install to only select the Deployment Images will still give you the error messages described in dpcreate.log.